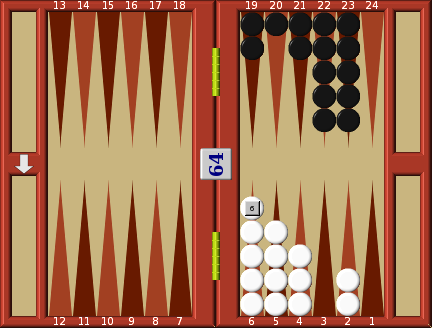 Backgammon is a very easy game to learn. This chapter gives the rules, explanations and instructions. As with all games learning this part is a little dull, but as you move on through the site you will get into the fun and excitement of the game. Thirty men, 15 of each colour. and finally an opponent with whom to play. Before you read any further get out your backgammon board, open it on the table in front of you and set out and follow every situation as you read about it. You cannot make any real progress if you read this site like a novel. Only practice will make you a proficient player. This diagram shows the board before the men have been laid out for play. It consists of 24 dagger-like spikes known as 'points' of alternate colour. They can be red and white, black and white or any two contrasting colours. Neither the shape nor the colour are of importance; the points are merely used to count the moves, and the alternating colours make it easier to count. The board is divided down the middle by a strip called the 'bar'. 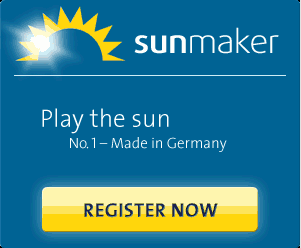 Each player has a 'home board' and an 'outer board'. The side nearest you is your home and outer board, the side further away is your opponent's home and outer board. This diagram shows the board with the men laid out in the starting position ready for play. Each side has five men on his 6 point, three on the 8 point, five on the opponent's 12 point and two on the opponent's 1 point. The two men on the opponent's 1 point are known as 'runners', and they have to travel the entire length of the board to get home. 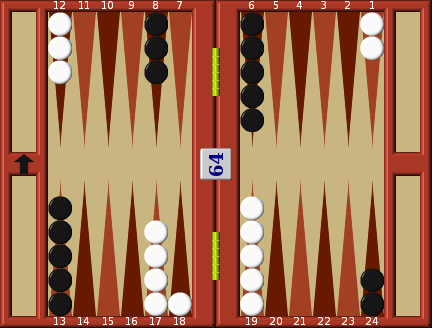 Play proceeds in opposite directions; the white and black arrows in diagram show the direction in which each player moves his men. 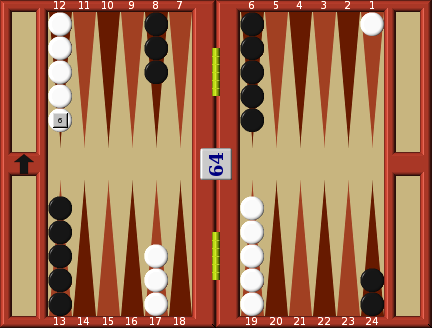 There are two different starting positions for backgammon. You can either have the home board on your right (diagram) or the mirror image with the home board on your left. 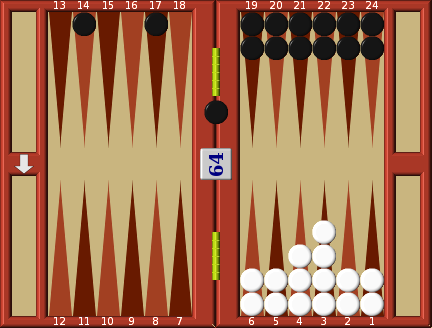 To win at backgammon you must move your men round the board from your opponent's home board to his outer board, onto your outer board and into your inner board. Once all your men are in your home board you start a process known as 'bearing off' whereby you remove all the men from the board with throws of the dice. The winner is the first player to remove all his men from the board. If there is any dispute between the players over the choice of colour or direction of movement, the matter is resolved by each throwing one die, the player throwing the higher die having choice of colour and direction of movement. To start the game each player throws one die. If they each throw the same number he process is repeated until one player throws a higher number than his opponent, and he has the opening move. His first move is determined by the two dice just thrown, his own and his opponents. Thereafter each player plays alternately, casting both his dice and moving accordingly. Each player has thrown one die for the assume the result is that Black throws a 5 and White a 6. White have thrown the higher number has the first move and must play 6:5. White now has a choice; he can move one man for 6 points, and another man for 5 points; or alternatively he can move one man for the full 11 points. Bear in mind that when you move one man for the total of the two dice you actually make 2 moves with the same man, and you must touch down on a point between moves. You do not jump all 11 points in one move. Diagram shows how White moves one man for 11 points. In this case he decides to move a runner from Black's 1 point. He starts the count from the point adjacent to the one on which he stands, and in moving passes over and counts every point on the way, whether they have men on them or not. The bar does not count as a point; it simply serves to divide the board into the inner and outer boards. A move of 6 brings White's runner to the opponent's bar point (7), where for a moment he touches down, and then moves on a further 5 points to join his five men on 12. There is no limit to the number of men of one colour that may be placed upon a point. The alternative choice for White is to move two different men, one for 5 points and the other for 6 points. Diagram shows White moving one man 12-18, and the other 12-17. When a player has two or more men on a point he 'owns' that point, and an opponent cannot land on it, nor may he touch down on it when moving the combined total of two dice. Look again at the first diagram and you will see that White cannot move 5:6. If he tries to move the 5 first he finds that he must touch down on (6) which is 'owned' or occupied by Black. By moving the 6 before the 5 he can arrange the move so that he touches down on a vacant point (7) and then moves on another 5 points to reach the safety of a point owned by him. A player who positions 2 or more men on a point is said to have 'made a point'. A player who makes 6 consecutive points has completed a 'prime'. An opposing man trapped behind a prime cannot move past, for it cannot be moved more than six spaces at a time, the largest number on the die. 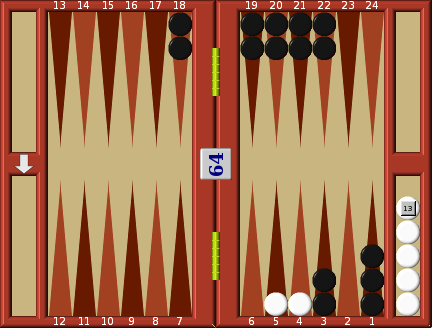 Diagram shows Black in this happy position with one of White's runners trapped behind his prime and unable to escape. A single man on a point is called a 'blot'. In diagram White has a 'blot' on (18) after he has completed his move. 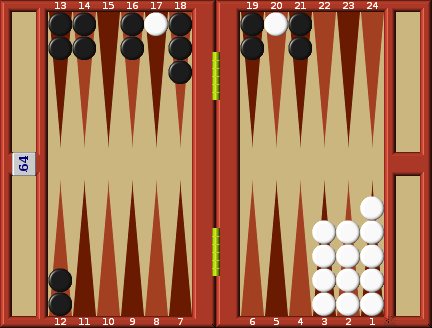 If Black can move a man onto (18), or touch down on it whilst moving the combined total of 2 dice, the blot is hit, is removed from the board and placed upon the bar. In diagram Black throws 6:5, and promptly decides to move one runner the whole way touching down on White's blot on (7) on the way and sending it to the bar, and continuing his move to the safety of a point he owns, (12). When you have a man (or men) on the bar you are not permitted to make any move until it (or they) get back onto the board. The man on the bar must re-enter the game in the opponent's home board. To re-enter the man, you must first throw a number on either die that corresponds to a point in your opponent's home board that is not controlled by him. Thus in diagram, if you throw 6:4, you cannot re-enter your man on (6) because he controls that point. You can re-enter the man on (4) which is a vacant point, and having done this you may now move any man on the board with the 6. If you have two or more men on the bar, you must get them all in before you can make any other move. In diagram, if you had two men on the bar and throw 6:4 you could only enter one man on the 4 point. As you still have one man on the bar which could not be re-entered you are unable to play the 6, which would be lost. You will now have to wait for your next turn to re-enter the last man. A player who has made all 6 points in his home board is said to have a 'closed board'. In diagram Black has a closed board, and White has a man waiting for re-entry on the bar. 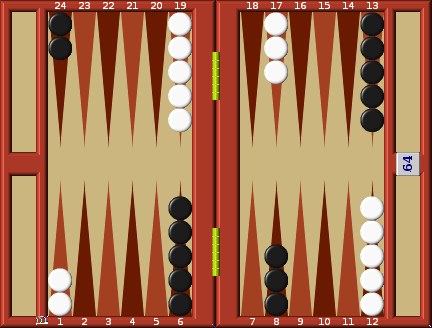 There are no vacant points in Black's home board so White cannot re-enter, and he must forfeit his turns until such time as Black opens up a point in his home board, thus providing a point for re-entry. If the same number appears on both dice, i.e. 6:6 or 3:3, this is known as a 'doublet', and the player is entitled to 4 moves instead of 2. By throwing 6:6 he can make 4 moves, each of 6 points. In diagram White has thrown 6:6, and decides to move both his runners 24-18, to make his opponent's bar point, and then to move two men 13-7 to make his own bar point. This of course would be a very satisfactory start to the game for White. In one move he achieves two major tactical advantages. Firstly, his two runners have made a flying start on the journey home and in the process have captured one of his opponent's most important blockading points. Secondly, he has made excellent progress in blocking Black's two runners by closing up his own bar point, giving him the beginnings of a blockade based on the three points: 8, 7 and 6. The great advantage of all doublet throws is that you can move your men in pairs, thereby always making a point and never exposing a blot. You do not have to move in pairs however; you can elect to play the four moves of the double in any way you like. Move one man for 4 consecutive moves of 2 points. Though you have complete freedom to use the 4 moves of a double in any combination you like, you will tend to use the double throws to make points by moving in pairs. Once a player has brought all his men into his home board, he can commence bearing off. Men removed from the board during this phase of the game are never re-entered into the game, and the winner is the player who first removes all his men. A player may not bear off so long as he has a man on the bar, or outside his home board. If during the process of bearing off the player leaves a blot that is hit by his opponent, he cannot bear off any more men. First he must re-enter the blot in his opponent's home board, and then bring it round the board into his home board before resuming the bearing off process. Look now at diagram. White throws 6:4, and removes one man from 6 and another from 4. Black throws double 6 (which like all doubles is played twice), and removes three men from 19. Then because he has no more men on 19, he is entitled to remove one man from 20, the next highest point, with the remaining move. Diagram illustrate another aspect. Both White and Black have gaps in their home boards, i.e. points with no men on them. If White throws a 3:1 he cannot remove any men because he has no men on those points. Instead he must move a man down from a higher point to a lower point. In diagram he moves 6-3 and 2-1. Black in the same diagram throws double 5. With the first 5 he removes the one man on the 20 point. He cannot remove any men from the 21 point because he still has men on 19. Therefore he is forced to move the 2 men on 19 down to 24. Now that he has no further men left on the 20 point or the 19 point, he must with his last move, remove one man from his 21 point. When the bearing off stage is reached you are not compelled to remove a man. If it suits your purpose you may move within your home board instead of taking a man off the board. Diagram is an illustration of the type of situation in which you would elect to move a man rather than take it off the board. In this case Black has a man waiting on the bar to re-enter your home board, and White throws 6:5. If he now removes one man from the 6 point, and one man from the 5 point he will expose two blots to Black, and it is probable that Black would hit one of them. White therefore must first remove a man from 6 with the 6 (he cannot move a 6 within the home board so is compelled to bear off the man with the 6). The remaining man on 6 he moves 5 points 6-1. In this way no blots are exposed for Black to hit. Plays must be made for both dice if possible. You have the choice of moving either number first, but you cannot refuse to make a move if it is possible. If you can make one or other of your moves, but not both, then the higher one must be made. In diagram White is down to his last two men and Black is still waiting in your home board hoping to hit a blot. If you now throw 3:1, you would obviously like to play the one by moving a man from (5) to cover the blot on (4). If you do this you would be unable to move the 3. The rule states	that if both moves cannot be made, then the higher must be moved first. White is forced to make a compulsory move (5)-(2). He cannot move the 1 which is forfeited and he finds that he is still forced to expose two blots to Black. An incorrect move must be corrected before the subsequent throw of the opposing player. Once the opponent throws his dice previous moves (correct or incorrect) stand. As you know, you must play your move if possible. You are not entitled to refuse it. It sometimes happens that you get, say, a 6-2 in a Situation where none of your men, as they presently are, can move 6. In that case you must, if you can, play a 2 in such a way that the man moved can then move the 6 afterwards. In Diagram, for instance, you (White) would much rather not be able to play your 6. However, you can play 2-6 and you are obliged to move a man on Black's twelve point to your eleven point and on to your five point, thus leaving Black a double shot at your remaining man on bis twelve point. Sometimes you can play part of your move but not all of it. In Diagram, you throw 5-3. You have a possible 5 and a possible 3, but not both. You would rather play the 3, making Black's eight point, but the rules require you to play the higher number, the 5, so you have to leave two blots. Each player throws his dice onto the board on his right. As long as he leaves the dice on the board, the player may change his moves several times if he wishes. Picking up his dice is the signal that his move is completed, and once he picks up his dice he may not change his move. If the opponent throws his dice before you have picked up your dice, he must pick them up and re-throw them after you have completed your turn. He may not use the dice that were thrown out of turn. If a die jumps the bar, falls outside the right-hand board, lands flat on a man, or ends up in a tilted position, then both dice have to be re-thrown. At the start of any game, either player may demand that the dice be mixed. To do this all four dice are placed in one cup, shaken and spilled out onto the board. Each player in turn then picks one die for his own use until all four have been selected. Mixing the dice is not done in the middle of a game. 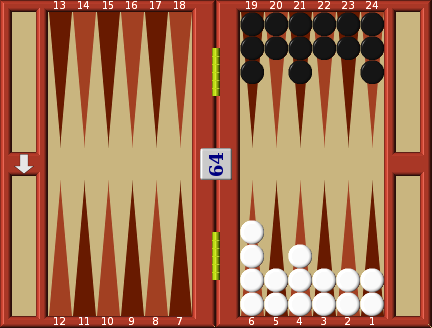 There are several methods of scoring in backgammon, we only use the traditional one. If you get all your men off the board before your opponent, you win a single game and score one point. If you 'gammon' your opponent by getting all your men off the board before he has removed a single man you win a double game and score 2 points. 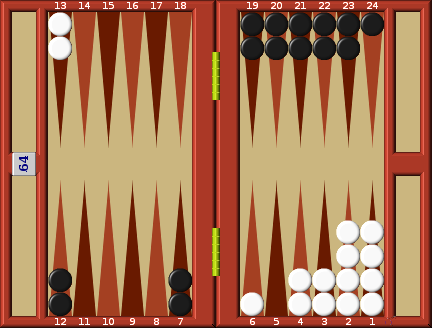 If you 'backgammon' your opponent, by getting all your men off the board whilst he still has a man on the bar, or in your home board, you win a triple game and score 3 points. The purpose of the double and triple game is to allow the winner to earn a suitable reward for a decisive victory. 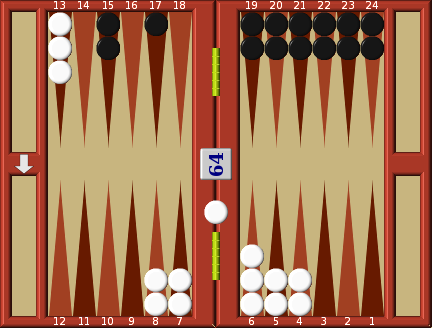 The doubling cube brings to backgammon extra excitement, tension and skill. Each face of the cube bears a number to record the progressive doubles and re-doubles, starting with 2 and goes on 4, 8, 16, 32 and 64. 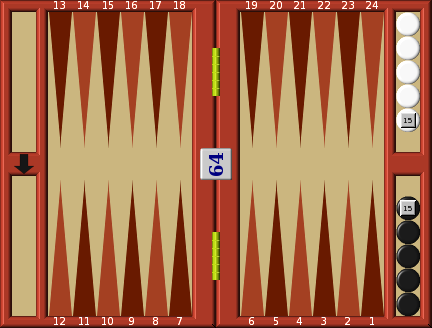 At the start of the game the doubling cube is placed in the centre of the bar, mid-way between the two players with the face turned to 64. This indicates that the cube is zero, and that neither player has possession of it. At any point during the game, a player who thinks he is in a winning position, may, when it is his turn to play, and before he casts his dice, double the stakes by turning the cube to 2, and pushing it towards his opponent's side of the board. His opponent has the choice of accepting (in which case the game continues at double the original stake) or refusing. If he declines a double the game is over, and he must pay over one unit of stake. The player who accepts the double draws the cube to his side of the board, and now 'owns' the cube. He now has the right to re-double his opponent at any point during the rest of the game, but the original doubler cannot re-double. If fortune favours him he can exercise his option to re-double his opponent, who will in turn be faced with the choice of refusing and paying up 2 units of stake, or accepting and playing for 4 units of stake. If he accepts he will then 'own' the cube, and only he can re-double the stake to 8, if he judges the situation to be in his favour. When a player is on the bar, facing a closed board so that he cannot make a move, he still has the right to double his opponent should he wish to do so. If the cube is at 2, and you win, you collect 2 units of the starting stake. If you win by a gammon (or double game) the loser must pay twice the amount on the cube, i.e. 2x2 = 4 times the starting stake. Likewise if the cube is at 4, and you win by a backgammon the winnings are 3 times the amount on the cube, 3 x 4 = 12 times the starting stake. If you bear all your men off the board before your Opponent has borne any of his off you win a 'gammon', i.e. a double game. That means that whatever the stake has become as a result of automatic doubles and of doubles having been offered and accepted, you win twice the amount. If, for example, the original stake was 1 but you have doubled Black to 2 and he has re-doubled you to 4, the stake has become 4. If one of you wins a gammon he wins 8. 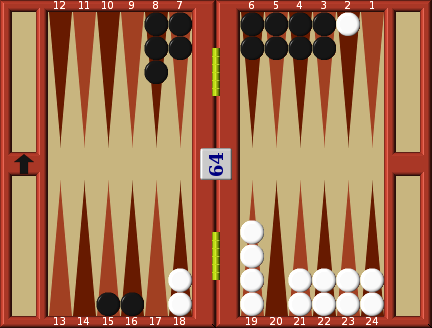 The rules of backgammon also provide for triple games, although players often agree not to play them, as they severely penalize the playing of 'back games'. When triple games are being played, a player wins three times the stake if he bears off all his men while his Opponent has borne off none of his men and still has a man either on the bar or in the winner's home board. Experience in tournament play shows that most triple games occur when the player who is behind is trying to bring off the 'coup classique'. If, in throwing for the first move, doubles are thrown, the cube is automatically doubled. If this is followed by another double, then the cube is automatically turned to 4 and so on each time you throw a double for the opening move. In this way the game can start with 2, 4, 8 or more times the original agreed stake. In addition some players allow each player to refuse the first throw of the dice, and to double the cube to gain the right to re-cast the dice in the hope of obtaining a more favourable throw. With all automatic doubles no one gains possession of the cube which remains in the middle of the board. If you are an inexperienced player and you are playing for money you would be well advised not to agree to automatic doubles, as it can cause sudden and enormous escalation of the stakes. You may have started out agreeing to play for 1€ per point and then, to your horror, find that after three automatic doubles, one double during the game and a loss involving a gammon, you have lost 32€. It is far safer to play for a higher starting stake than to agree to open-ended automatic doubles. There are other forms of automatic doubles, and re-doubles not discussed here, so take care to establish the position clearly before you start to play. The doubling cube, also called a doubling block, is a square die larger than the dice rolled in the game. It is used to double the stakes for which you play. On each face of the cube are numbers: two, four, eight, sixteen, thirty-two, sixty-four. Doubling cubes are made of different materials such as opaque plastic, ivory, wood, precious metals, or clear plastic. Some are octagonal in shape. There are now doubling cubes manufactured that start with the number one. And there are backgammon boards made with three holes on the side of the board, or right in the bar, into which the doubling block fits. This eliminates the possibility of the block sliding off the board. The use of the doubling cube was invented in this Century to add another gambling element to the game. Middle Eastern players are not familiar with its use. The proper handling of the doubling cube is a very important part of the game both in money and tournament playing. 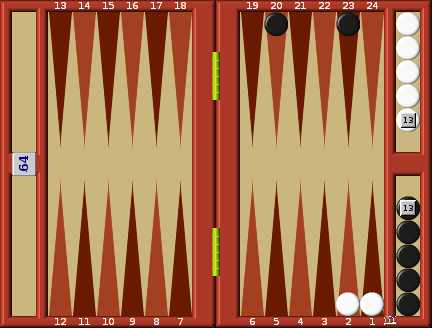 When the game has reached the point where both players are bearing off, as in the following illustration, the doubling strategy is particularly crucial. In this situation, Black with one man on his five-point and one man on his two-point (or if his position is better) should double. His chances of throwing the proper combination to bear off are in his favor. The board does not have to be set up as it has been in both games we have played; it can equally well be set up as in diagram. In this case, the White home board is on the left at the bottom and the outer board at the right. The Black inner board is at the top left and outer board at the top right. It makes no difference whatever to the way the game is played. Your (White) pieces are now moving clockwise, from left to right in Black's side of the board and right to left in your side of the board. Black's pieces are moving in the opposite direction to yours. Get used to playing with the board either way round. Soon you will be so used to it that you really can't remember which way round you played last time. But if you always play one way and then find yourself having to play the other, it can be a little disturbing at first. There is no rule about which way the board should be set up. It is sometimes said that the correct way is to set the board so that the home boards of both sides are nearer the main source of light, so the action in the home boards takes place in the light.